While I was staying with my mother for Mothers Day, she wanted to make a pecan pie for dessert. Sadly, she could not locate her recipe for it. A Google search came to the rescue, and I found the BBC Good Food website recipe for Maple Syrup Pecan Pie. We just used store bought shortcrust pastry with the filling from the recipe. This pecan pie was really good, because it was not overly gooey and sweet, like some pecan pies can be. This one was a winner for us, and made a great dessert served warm on a cold night. Before I went on holidays, I had a massive container of ricotta cheese to use up. I came up with some recipes that I felt so so about after a Google search, but the Eureka moment came when I read about a raspberry ricotta cake on The Amateur Gourmet. It looked devine and just what I wanted to make. The recipe is Bon Appetit's Raspberry Ricotta Cake. I followed the recipe to a T save for adding an extra quarter cup of raspberries on top (because I didn't have any). 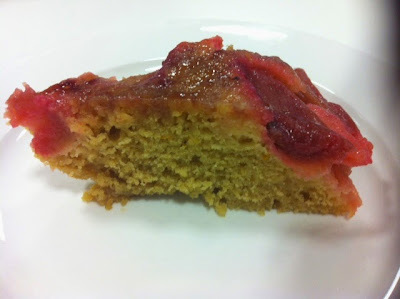 It turned out to be a beautiful cake - moist, light and with tang from the raspberries. It was also good on its own served at room temperature next day. Loved this cake - I'd make it again. This week for French Fridays with Dorie, we have to choose your favorite, loved the most, best recipe in FFWD to share this week and explain why, and share our top 5 favorites. There are many recipes in Around My French Table that I really loved. When I went back through my FFWD posts to make a list of the recipes that I liked the most, I noticed that a recurring theme was Dorie's meat and fruit combinations - chicken tagine with sweet potato and prunes, duck with kumquats and pork with mango and lychees. Accordingly, it made sense to me that I would choose one of these meat and fruit dishes as my AHA! moment. It was hard to pick one dish over another, but I landed on Dorie's Lamb Tagine with Apricots. This tagine pairs meat with fruit in a classic sweet and savoury combination, and jazzes it all up with a mix of spices. My experience is that the tagine tastes best next day, when the flavours have had time to develop and meld. I have made tagines before Dorie's, but not all of them hit the mark. This one is particularly good, and tastes fabulous with Dorie's cardamom rice pilaf, or ordinary brown rice. To see what the other Doristas regarded as their AHA! moment from AMFT, visit the LYL section of the FFWD website. 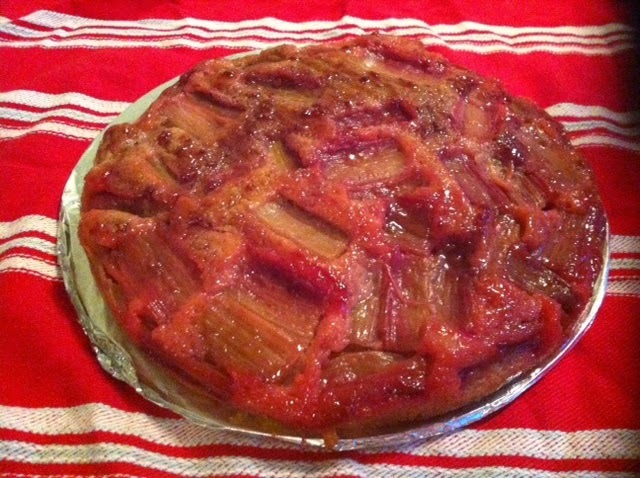 For Tuesday with Dorie (Baking Chez Moi) this week, our recipe is Rhubarb Upside Down Brown Sugar Cake. This cake was simple to make, amd took just over an hour, including preparation. My baking time was more like 40 minutes than the 20 minutes stated by Dorie. I started making the cake batter while the rhubarb was stewing in its juices so that I could streamline the process (as you do when you start baking at 9pm). The resulting cake was beautiful, light and moist with a caramel flavour from the brown sugar, and the tangy rhubarb topping worked a treat as a contrast to the sponge. I used raspberry jam as a glaze and that worked fine too. To see what the other TWD bakers thought of this cake, visit the LYL section of the TWD website. 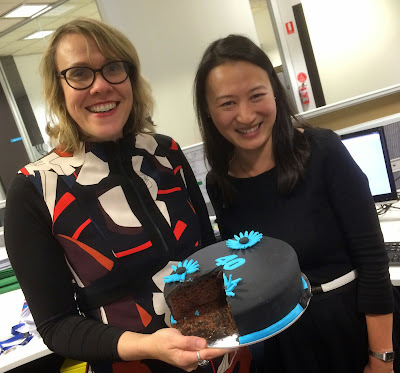 Wow, I can hardly believe it - I have been blogging in this space for 8 years today. My blog started with modest aspirations - I just wanted to chronicle what I cooked. I had been a "lurker" for a couple of years beforehand after discovering food blogs through a newspaper article on cupcakes. The first blogs that I read were Cupcake Bakeshop by Chockylit and 52 Cupcakes by the Cupcake Queen.It all grew from there. After I while, I figured that there was no reason why I couldn't start my own blog. The beginnings of this blog were humble, and it still is - I keep it because I enjoy chronicling my food adventures, and since joining various cooking groups online, it has also become a social activity for me. My cake batter probably wasn't quite right as it was so thick, I pressed it into the pan rather than poured it, but no matter - the cake seemed to turn out alright in the end, and any dryness was more than compensated for by the cream cheese filling and ganache. 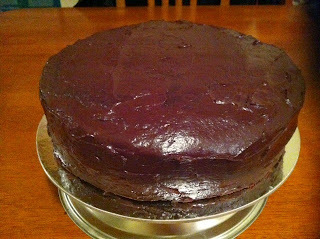 Poh's ganache recipe worked out really well - you could apply it straight away without it running all over the place. In case you wondering about the name of this cake, it comes from the name of a heavy metal band in which Poh's brother-in-law, Mikey, is the drummer - Poh makes this cake for the band whenever they stay with her. If you fancy a chocolate cake with a difference, then the Totally Unicorn Beetroot Cake is definitely worth a go. I recently made some plum jam using yellow plums. To make jam, the general rule is one part fruit to one part sugar. In this case, I also added the juice of a lemon to up the pectin content (which helps the jam to set). I removed the plum stones but left the skins on to give some texture to the jam. Once you have your fruit, sugar and lemon juice (if using) in a saucepan, you bring it all to a rolling boil and continue to boil until it thickens sufficiently that when you place a drop of it on a plate that has been in the freezer and run your finger through it, it wrinkles and a gap remains where your finger had been. If the jam runs back into the gap and doesn't wrinkle, it is not ready yet, so you have to keep boiling it. Once the jam is ready, pour it into jars that have been sterilised (by placing in the oven for 1 minutes or by boiling in a pot of water) and seal. Making a jam is a great way to use up surplus fruit, or to preserve a slice of summer for the winter months ahead. I hate wasting ingredients, and I find that Google is my friend when I am looking for ways to use up odds and ends of perishable ingredients. Recently, I found myself with the best part of a can of coconut cream to use up. 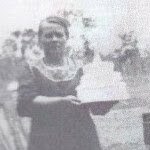 Turning to trusty Google, I found this recipe for coconut cream cake by Anne Thornton. 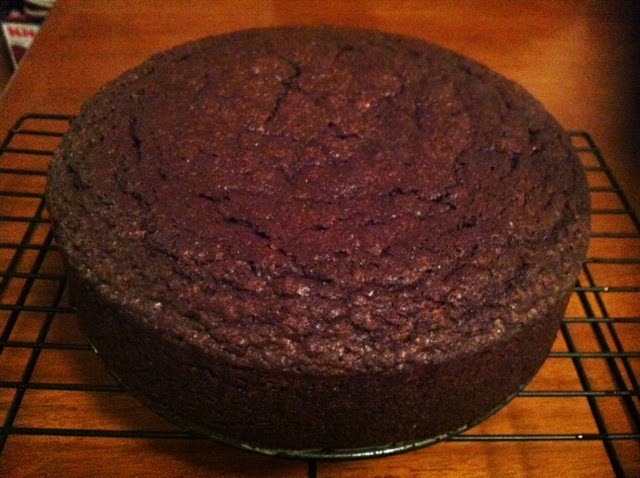 This cake is beautifully moist and very coconutty in flavour. I would definitely make it again. Well folks, it's been a wild ride, but here we are - the last one. We are up to the very last recipe in Around My French Table - Chicken in a Pot - the Garlic and Lemon Version. This is the cover recipe, so it is fitting that it is the last recipe that we make. The recipe has been posted online here. You can see pretty easily from the photos what comprises Chicken in a Pot - roast chicken and vegetables with broth steamed in a pot in the oven, with a basic dough used to seal in the steam. The vegetables are the classic combination of carrots, onions and celery, with sweet potatoes and whole garlic cloves thrown in for luck. The broth is comprised of chicken stock, white wine and herbs. The dish is served with bread on the side - for soaking up the broth, of course!!! There is nothing not to like here - who doesn't like roast chicken? It was an easy to dish to make - not much chopping, and the chicken and vegetables being browned before going into the oven to give them some colour and flavour. For the last time on our almost five year journey, go visit the LYL section of the FFWD website to see what the other Doristas thought of Dorie's Chicken in a Pot – the Garlic and Lemon Version. However, don't despair - we are partying on for another four weeks to reminisce about the highlights of our Around My French Table odyssey. Join us for the fun! It was my turn to pick for Eating with Ellie this week, and I chose Shrimp Creole. I went seriously off piste with this recipe. I found I had no onions, so I used leek. I bought a yellow, not a green, capsicum. I used Cajun seasoning as Creole seasoning is not a thing here, and Cajun sounded pretty close. I also used frozen spinach instead of fresh baby spinach, as I used up all the baby spinach on something else, not realising that I needed it for this. I really enjoyed this dish. It had a bit of zing, with the Cajun seasoning and tabasco sauce, and tasted really good. This is definitely one I'd make again. 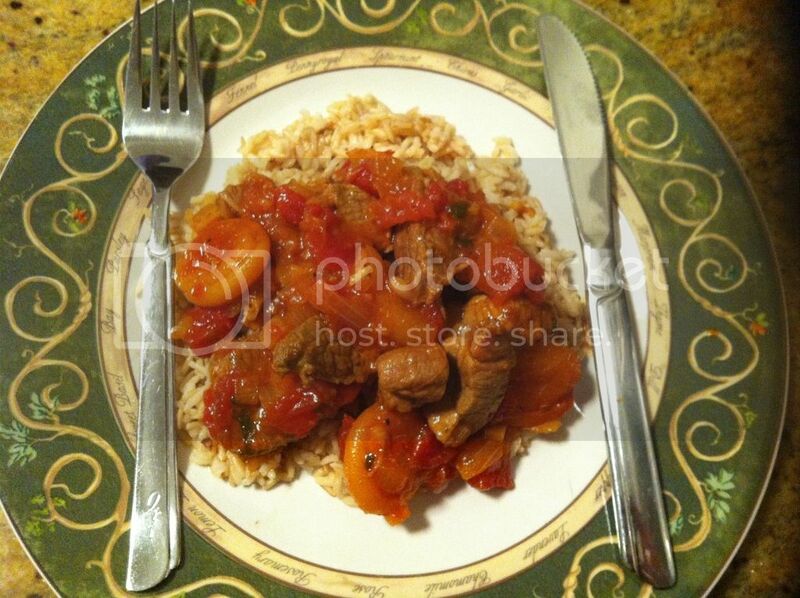 To see what everyone else thought of this dish, visit the LYL section of the EwE website. For Wednesday with Donna Hay this week, Kayte chose Hot Potato Mustard Dressing from p143 of Off the Shelf. This involves boiling kipfler potatoes, and while they are still hot, tossing them with a mustard based dressing (ingredients here). I don't like red onions, so I swapped them for shallots. The dressing was very tasty. As suggested by Donna, I served my potatoes with some pan fried salmon. To see what the other Donna cooks thought of Hot Potato Mustard Dressing, visit the LYL section of the WWDH website. If American style sandwiches are your thing, you can't go past Bowery to Williamsburg in Oliver Lane, Melbourne. I am late to the party on this venue, which I found out about by accident through a colleague who raved about their Reuben sandwich. I love a good Reuben, so I couldn't resist trying the version at Bowery to Williamsburg, where the Reuben is their signature sandwich. The prices are rather steeper than the Reuben that I had in Branson, but that is true of most things in Australia. It gets very busy, so it is best to go early for lunch. It turned out to be a good move, as Tim preferred the Reuben and I preferred the Rachel. Both sandwiches were tasty and very filling. You can order a sandwich, side (either macaroni cheese or salad) and a drink for $17. I am glad that we didn't - I was well and truly satisfied with just the sandwich. I'd definitely go back - the food was good and plentiful, and the service was friendly. Recently, Tim gave me some kumquats from his parents' tree. I had sent him an email about a kumquat cake recipe by Claire Ptak, so he provided me with the kumquats to make the cake. Today is Food Revolution Day, a global campaign launched by Jamie Oliver to put compulsory practical food education on the school curriculum. One of the Doristas, Mardi, is an ambassador for Food Revolution Day, hence for French Friday with Dorie this week, we are hosting a French food revolution. Mardi has asked us to choose a recipe or technique that we have learned from Around My French Table that we think is a "must know". Now, while I realise that pastry is not a necessity of life, it is a very handy skill to have, as pastry can be used as a basis for making meals such as pies and quiches, as well as for making desserts and treats. Before Dorie, making pastry scared me, as I had had more than one failed attempts at making it. However, through Dorie, I have discovered a fail-safe technique for making pastry that is quick and easy, and does not even require you to endure the sometimes tricky task of rolling out the dough. The recipe that is now my go-to pastry recipe is Dorie's Sweet Tart Dough from Around My French Table. Although it is a sweet tart dough, I don't see why it can't double up for certain savoury applications because it is not overly sweet (but note that Dorie also has a "good for almost everything" tart dough that can also be used for this purpose). Fun to make, good to eat, and best of all, you know what is in your food because you made it from scratch - no nasty chemicals. To see what the other Doristas learned from Dorie for our French Food Revolution Friday, visit the LYL section of the FFWD website. For Eating with Ellie this week, Peggy chose Asparagus and Mozzarella Pizza. 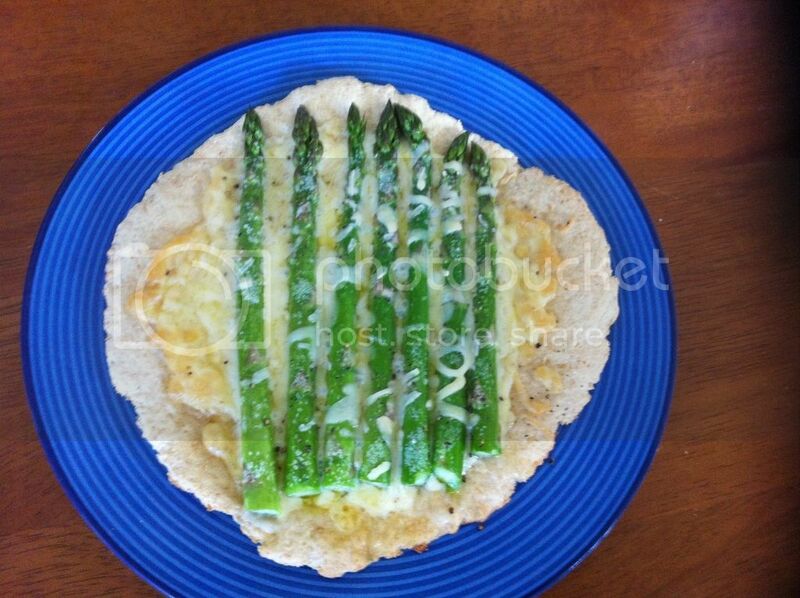 This dish involves a wholemeal pizza base topped with cheese and asparagus. Bought pizza dough is not a thing here, so I made my own wholemeal pizza dough from this recipe. I am not a big pizza eater, so I reduced the recipe by half to make a 6" pizza for one. Because I used a smaller pizza base, I could not arrange the asparagus spears in spokes, as suggested by Ellie. While I lost the visual wheel effect, it had no influence on flavour. I quite liked this pizza as a light meal. Asparagus is one of my favourite vegetables, and with the cheese, it makes a moreish combination. To see what the other Ellie cooks thought, visit the LYL section of the Eating with Ellie website. 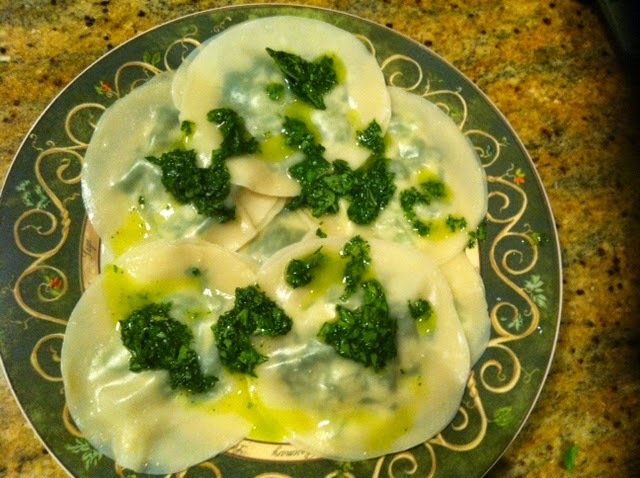 It was my pick for Wednesday with Donna Hay this week, and I chose Spinach Ravioli with Basil Oil from Seasons. The recipe is also posted online here. This ravioli is made using gow gee wrappers from the deli section of the supermarket as the pasta. You then place a small amount of spinach and ricotta filling in the middle of a wrapper, brush water around the edge of the wrapper as glue, and place another wrapper on top and press to seal. Instant ravioli! I liked this dish a lot. It was very filling and cheap to make, hence is a winner in my books. To see what the other Donna Hay devotees made of this dish, visit the LYL section of the WWDH website. This week's Tuesday with Dorie recipe is Nutella buttons. These are little mini white cake cupcakes filled with Nutella and topped with either ganache or white chocolate. As you can see, I went the white chocolate route, and spread it on rather than dipped it because I found the chocolate to be too thick for dipping. 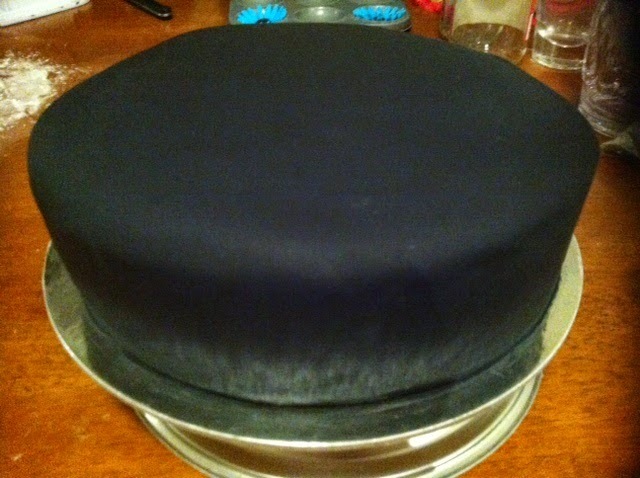 My "buttons" were not domed on top like Dorie's, but they sure tasted good. To see more of these little cakes, visit the LYL section of the TWD website. 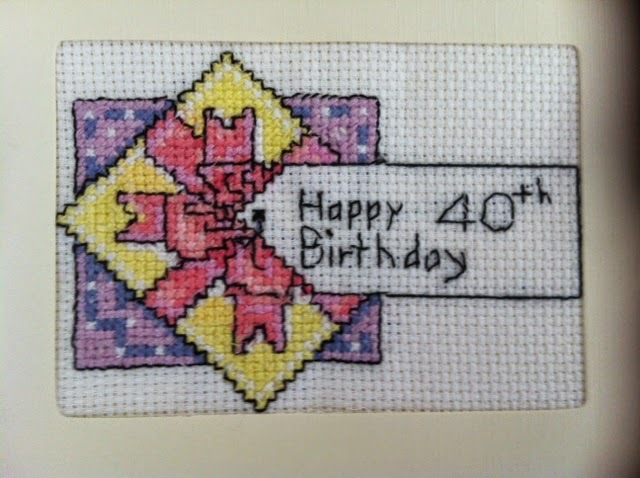 Today is my colleague, Swee's, 40th birthday. To celebrate this momentous occasion, I have made her a birthday cake. Voila! I am very happy with this cake. Preheat your oven to 160 degrees Celsius. Grease a deep 23cm round cake tin, and line the base and sides with baking paper, making sure the paper extends ~ 5cm above the top of the tin. Dissolve the coffee in 185mls hot water. Put the butter, sugar, chocolate and dissolved coffee and water in a saucepan. Stir over a low heat until smooth, completely melted and blended. Set aside. Sift the flours, cocoa and bicarbonate of soda into a large bowl. Make a well in the centre. Add the combined eggs, oil and milk; pour into the well in the dry ingredients, and using a spatula, mix well into the dry ingredients. Add the cooled melted chocolate mixture, and fold in until there are no lumps. Pour the mixture into the prepared cake tin. Place the cake into the preheated oven and bake for 1 hour and 45 minutes or until cooked through when tested with a skewer. Leave the cake in its tin on a wire rack o cool completely before decorating. For the ganache, I used Poh's ganache from her Totally Unicorn Chocolate Cake recipe, found here.